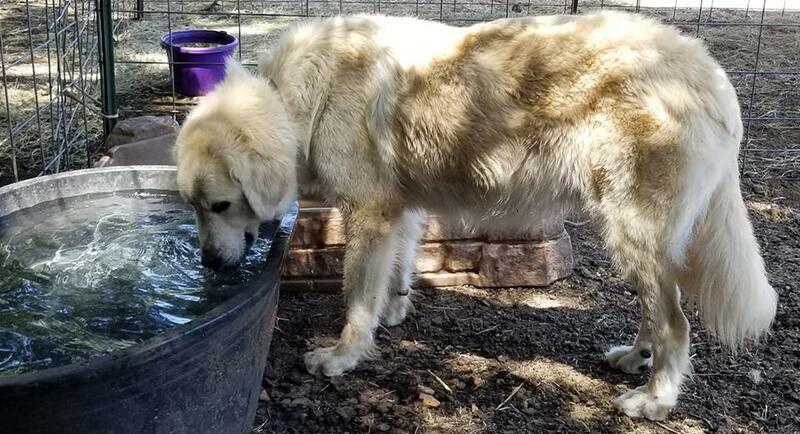 What is a Livestock Guardian Dog (LGD) ? LGD's are a specific kind of dog that have been bred for hundreds of years to protect livestock. These dogs are VERY different from Guard dogs such as German Shepherds. They are also VERY different from herding breeds such as Border Collies. LGD's BOND very strongly with their livestock. They become one with the herd or flock. They learn to read the livestock and often form close bonds with them. They learn to communicate with their stock. They are dogs that stay with their livestock night and day, rain or shine. LGD's are NOT attack dogs. LGD's use the LEAST amount of force necessary to protect their stock. They assess each threat to their LIVESTOCK and act accordingly. These dogs do NOT go looking for a fight. Barking is their #1 way of protection. They will place themselves between the threat and the stock and bark. If that does not work, for a minor threat, they will even try posturing and sometimes use their size to bump a threat back. Typically as a last line of defense they will actually attack the threat. Livestock Dogs have a Mind of their own! LGD's do need to learn some manners such as boundaries. Basic training is highly advised (walking on lead, coming when called, loading up in a kennel, etc). HOWEVER, these dogs were bred for hundreds of years to make decisions on their own. These dogs need to be able to think and react on their own which sometimes seems like they are ignoring you. Pups can leave as early as 9 weeks old. If you don't have an ADULT working Livestock Guardian already I recommend they stay a little longer. A small # of pups can stay UP TO 16 weeks for an extra fee. Each puppy will go home with their record sheet, a slicker brush, nail trimmers & a sample of the food they are use to. They will be $350 per pup if picked up by 10 weeks old. Pups that are here PAST 10 weeks old their will be an additional $25 per week. This includes any additional vaccines and deworming they need while they are here. Anyone here at 16 weeks will be taken in for a rabies vaccine. ​All pups come with LIFETIME "Technical" assistance if you run into any hiccups in the training and learning stage of their life. While a GOOD LGD may be rock solid with goats and larger stock by a year old remember they are still PUPPIES. Chickens are by far the hardest thing for them to learn. Once they DO learn they are worth their weight in gold. ALWAYS expect a LGD to take up to 2 years to fully mature and be safe with all stock. They are BIG, Goofy nearly 100lb puppies for what seems like a very long time! Puppy #1 - Dark Blue Collar - "Mr. Mustache"
Color : While he looks Black I believe he is just like a Bear, a VERY dark Sable.